Please check back soon. We will be adding information about other ocean issues, like offshore drilling and wave energy activities. Act Now to Protect Point Arena’s Wild Ocean Ecosystem for Sustainable Food! Ken Weisman, of the Resources Legacy Fund Foundation, the private corporate consortium that is running the process of setting up no-take zones up and down the California Coast, then said we were an “overlooked constituency,” because he had no idea there was any commercial edible seaweed hand-harvest happening in Northern California. Suddenly we knew that something had gone very wrong with the Collaborative Stewardship successfully practiced by the Mendocino Seaweed Stewardship Alliance and the Fish and Game Commission. This Collaborative Stewardship, with seaweed commercial hand-harvesters in close touch with Fish & Game wardens and biologists, has led to a sustainable ocean harvest industry, and the best edible seaweed harvest regulations on the West Coast. Now we’re asking people who support our sustainable sea palm harvest to contact Senator Patricia Wiggins, Chair, Fisheries and Aquaculture Committee, California State Legislature. Please let Senator Wiggins know why Northern California edible and medicinal seaweed is important, or even vital, to you. Barbara and I recommend that the California State Legislature suspend implementation of any new no-take “Marine Reserves” until their full impact on sustainable, harmonious ocean food harvesters is fully studied. People have been part of the wild intertidal ocean ecosystem in Northern California since time immemorial. Last summer, the oldest meal ever found in the Americas, the Monte Verde find in Chile, was fourteen thousand years old; this ancient feast had nine different seaweed species in it! 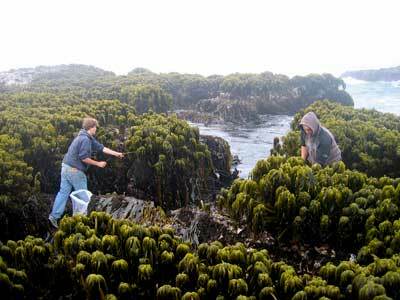 The proposed new no-take areas would outlaw tribal seaweed, shellfish, and other intertidal harvest which is fundamental to many ancient cultures in Mendocino County. This is a de-facto act of genocide. We believe these new proposed no-take zones threaten the existence of the most beautiful life-forms we have here, ancient tribal cultures still living and practicing harmonious, spiritually-attuned lifestyles as much as possible in the modern world. Please ask Senator Wiggins to listen to the community of Point Arena, where many low-income people depend on mussels, rockfish, abalone, and edible seaweed for subsistence food and livelihood. The new no-take zones near Point Arena would severely impact subsistence ocean food harvest, including all of the sea palm blade-tip harvest we’ve practiced at Point Arena Lighthouse Point for thirty years. Barbara and I really believe that it would be good for the ocean environment and human health for the California State Legislature to take another look at the 1999 Marine Life Protection Act. We believe that this Act orders the California State Fish and Game Commission to do something impossible: to impose zones in state waters and the intertidal zone where no human being can be a food harvester, and to do this for good scientific reasons. Contact Senator Patricia Wiggins--Support Sustainable Ocean Fishing and Food Harvest! Don’t Let the Oil Lobby “Divide and Drill” at Point Arena! For thirty years, the edible seaweed harvesters of Mendocino County have been at the forefront of the movement for permanent protection from offshore oil or gas drilling for the California Coast. Today the leasing process which leads to offshore oil drilling is open for the Point Arena Basin. As Californians, we must pause for a moment our divisive debate about new no-take zones for food harvesters, and express our united opposition to offshore oil development in the Point Arena Basin! According to the U.S. Minerals Management Service notice in the Federal Register, the Point Arena Basin is one of several "offshore areas that have the highest oil and gas resource values and highest industry interest." This drilling is a direct threat to all Marine Sanctuary areas in Northern California. The great California Current constantly takes essential nutrients from the Point Arena Upwelling to feed life all the way to Monterey Bay. Comments are needed now to put all issues into the MMS process. All will be public and published if submitted by people associated with businesses or organizations. Please visit www.mms.gov to add your comment. The MMS asks that we include our names and return addresses when commenting, and reference "2010-2015 Oil and Gas Leasing in the Outer Continental Shelf." Lease Sale 236 would open the Point Arena Basin for leasing in the year 2014. Barbara and I are demanding that the new management at the MMS stop all efforts to open offshore oil and gas drilling, and join all of us in support of Congressman Mike Thompson's bill for permanent protection from oil and gas development for all California's offshore waters from the Sonoma-Mendocino County border to Oregon. Introduced on the first day of the 111th Congress to protect the great Northern California Upwelling Ecosystem, the "Northern California Ocean and Coastal Protection Act" is a simple, two-page permanent oil and gas drilling ban. One of the five members of the Blue Ribbon Task Force which directed the process of choosing new Marine Protected Areas for the North Central Coast--from Pigeon Point south of San Francisco Bay, northward to Alder Creek, just north of Point Arena--was Catherine Reheis-Boyd, CEO and Chief of Staff for the Western States Petroleum Association! There seems to be a clear conflict of interest when the top western states offshore oil drilling lobbyist is put in charge of a process to protect the clean, wild ocean ecosystem. Is it coincidence that the “Integrated Preferred Alternative” presented by the Blue Ribbon Task Force to the California State Fish and Game Commisson calls for closing fishing tracts and intertidal areas near Point Arena, where many people sustainably harvest food for subsistence?